Our Display Ad Sizes Are Available At Very Affordable Rates! We know $ is tight, so we’re here to help you advertise in an economical way. No extra charge for full-color ads! Choose from a size on our rate sheet or submit an existing ad for a price quote. Also available: business card ads: only $5 per insert Special events flyers for non-profits: only $10 to run as a full page ad! (Small non-profits only) We welcome display ads for businesses, special events, church announcements, cards of thanks, birthday/anniversary wishes, etc., whatever message you’d like to get out to the public. And because the e-Ticker is distributed as a PDF that readers scroll through, they cannot pass over your ad without seeing it, unlike print media! Run your business card for just $5 per insert. Does your small non-profit have a flyer announcing a special up-coming event?? E-mail it to me and I will run it as a FULL-PAGE ad for only $10 per insert!! Only $30 for large non-profits, marked down from the full page regular rate of $50. Classified LINE ads: only $3 per insert for ads of 40 words or less. Longer ads: $5 for ads 41 to 100 words; longer ads will be set up as display ads and charged accordingly. (Lost/ Found ads are free). If you would like to include a photo with your line ad, add $5. 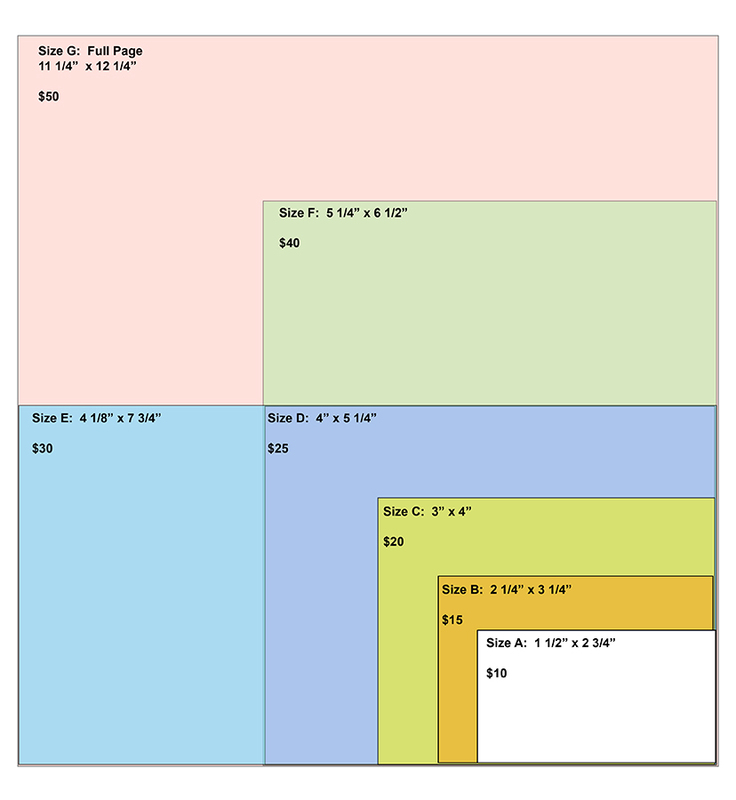 Choose your display ad size from those illustrated on page 1. Or submit an existing ad for a price quote. Advertising Deadline: (Display and Classified) – Saturday noon, for the following weekʼs edition. Exceptions will be made to allow last-minute advertising to be placed. Our goal is always to try to work with you, to serve you in the best ways possible. This is your community newspaper! If you are a first-time advertiser, payment isrequested at the time the ad is placed(this may be waived). For electronic payment–using credit or debit cards– I use Pay Pal. Simply supply your e-mail address. When payment is due, you will receive an e-mail from etickernews@gmail.com with easy instructions on how to pay through PayPal. You DO NOT need a PayPal account of your own to use this handy and secure service! Proofs for display ads are available, upon request. Advertisers are solely responsible for the content of their advertising. The e-Ticker News reserves the right to refuse any material it deems inappropriate. Classifieds: $3 per insert or $5 with a small photo.